The people at Moleskine have a lot to answer for. In the last few years I’ve become addicted to their highly desirable yet expensive notebooks, making them the cackling recipients of money I might otherwise have spent on pistachio nuts. Yet this misappropriation of my hard-earned funds is not the cause of the sullen, accusatory gaze that I now cast towards those Moleskine folk. No, this is something much bigger. I’m starting to suspect they’ve created nothing less than a prison for ideas. It may be an elegant and nicely designed prison – one whose bars, when clenched, give a pleasing and tactile sensation rather unlike the cold, rusty steel of a traditional penitentiary – but it still gets the job done. This gilded cage is something that ideas need to escape if they are to truly thrive. Now the Moleskine people – and other expensive notebook makers – would emphatically deny this. They’d probably suggest that an aspiring idea could hope for no better start to life than on the pages of their costly but obviously top-notch products; that ideas sketched on their subtly creamy sheets are destined for greatness, unlike those scrawled on the backs of napkins whose lowly origins will eventually drag them down into the gutter. I probably felt the same way up until recently, otherwise I wouldn’t have been buying Moleskines or other pricey pads in the first place. I guess I felt like the snazzy notebooks would force my ideas to up their game somehow. Pen would not hit that lustrous paper unless the idea to be conveyed deserved to live on that prime real estate. My customary messiness would be eliminated. So by the time I scribbled on its final page my notebook would be headed not for the recycling bin but the bookshelf, maybe even the coffee table, propelled by its merits as an artistic artefact in its own right. This misses the point of notebooks entirely. 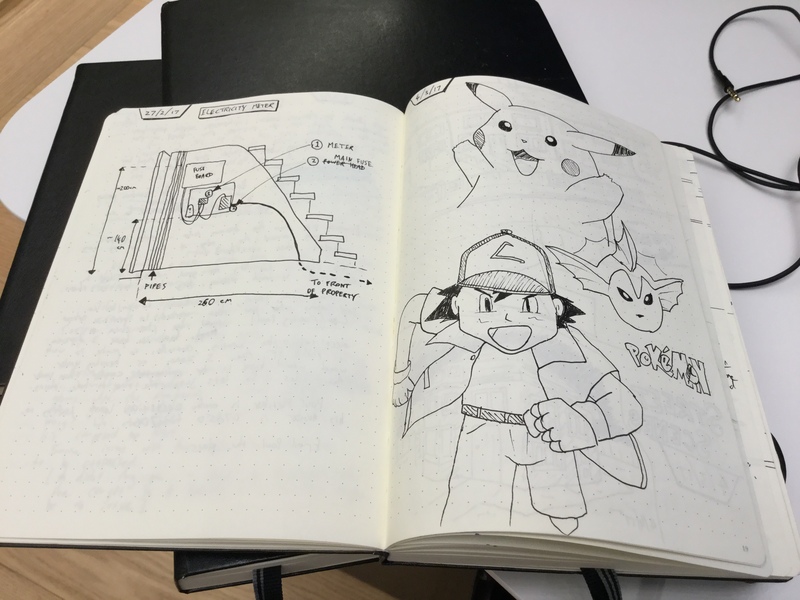 When you need to write something down or draw something, the thing you reach for should be your notebook. If you pause for even a fraction of a second to consider whether the information or idea or whatever it is “deserves” to be in the notebook, then the thing you’re reaching for isn’t really a notebook at all, it’s a canvas for more fully formed ideas. Because notebooks aren’t supposed to be works of art; they’re supposed to be a mess. That pause, that momentary flash of doubt about something deserves to be written down, can be thought of it as a filter – let’s call it the “Moleskine Filter” – because it attempts to filter out bad ideas before they sully the pristine pages of your Moleskine. And I see the Moleskine Filter as a bad thing because ideas aren’t in a position to be judged until they’ve been reified in some way. You need to put that idea down, get it out of your head somehow, before you can sit back and decide what to do with it. If your notebook doesn’t help you do that, then what else will? So I’ve decided to embark on an experiment: I’m stepping away from expensive notebooks and their seductive allure. As a first step I’ve just bought a notebook which cost less than a third of an equivalent Moleskine. It’s not a good-looking notebook and it doesn’t feel like it’s going to hold up to wear and tear very well. In fact I suspect it’ll look very battered and beaten up after a couple of weeks in my pocket. I can’t wait. My theory is that having a cheap notebook that was never going to rival the Sistine Chapel ceiling will nullify the effect of the “Moleskine filter”, helping more of my thoughts and ideas to make it on to paper where they can be fairly evaluated. If I’m right – if such a filter exists, and cheap notebooks can vanquish it – then I’ll have successfully liberated my ideas from their snazzy Moleskine-branded prison. But if I’m wrong, and it makes no difference, then at least I’ll be able to use the money I’ve saved to buy more pistachio nuts.